HUCKNALL is fortunate in that its general history has been written by Mr. J. H. Beardsmore, while noteworthy books by Can. Barber and Mr. A. Brecknock, although treating especially of Lord Byron also throw important lights upon its past. Can. Barber's "Byron— and where he is Buried," includes an account of the author's remarkable excavations of 1938, which have completely revolutionised our knowledge of Saxon Hucknall, for they revealed unmistakable foundations of a church, of that period unrecorded in Domesday and hitherto unknown. The Geological Surveys tell of Glacial drift which caps the ridge between the valleys of the Erewash and the Leen, now recognisable as a whitish clay. At the foot of the ridge on the southern side lie large boulders swept down from the Lake District inprehistoric times. In 1870 Mr. S. Dutton Walker drew the attention of the Society of Antiquaries to a series of shallow graves containing remains of 35 human bodies, which had been uncovered during drainage operations near the old village school. That this antiquary should have informed that body of the discovery argues that he deemed them ancient, and the view appears to be fortified by the inclusion of a note on these interments in the Romano-British section of the Victoria County History. There is, however, the possibility that the remains were of soldiers slain in skirmishes during the Civil War. A discovery of Roman coins and tiles suggests the existence of a villa, or an outpost linked with the camps at and about Arnold. Its vestiges may have lured Saxon invaders to settle here. There can be little doubt that their humble dwellings would be erected on the elevated site now occupied by the church, and that their leader would have his hall in their midst. Canon Barber considers that it stood immediately west of the church tower; Mr. Beardsmore suggested a position a little to its south and at the end of the Saxon era the village stretched from the present Spring Bank to the Yew Tree Inn. Mr. Harry Gill thought it lay north and east of the church. Canon Barber's reconstruction goes back to the 7th century and pictures early Christian, missionaries who would probably baptise their converts in the stream which, although now invisible, yet runs beneath the churchyard path. They left behind them a cross around, which the inhabitants worshipped until, perhaps in the 8th century, a little church was built. In 1938 the Canon unearthed the unsuspected foundations of this church and so complete were his investigations that its ground-plan and that of its medieval enlargements were completely revealed. The full story of these discoveries is related in his book and their significance lies in the fact, that until then it had been generally believed that Hucknali's earliest church dated from about 1200. Ulchet, the' last Saxon lord of the village, probably rebuilt or enlarged the then ancient church, converting it into his manorial chapel adjoining the hall of timber he erected for himself. 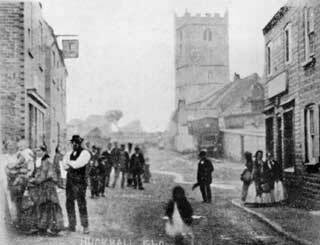 Tradition has it that it was from this abode that the village took its name, but the idea that "Hucknall" is a diminutive form of "Oaken-hall" finds no acceptance among place-name experts who, while often at variance on other names, state with one voice that this place was the "healh" or nook of triangular shape, of an owner called Hucca. Of this person nothing is known, his name was rare, but "health" in its abbreviated form of "all" is common all over the country, Nuthall, Teversal and Ordsall being local instances; Under Norman Sway. The Norman Conquest found Hucknall divided between various owners all of whom were dispossessed in favour of Norman knights. A small part went to William Peverel. The greater part was taken from Ulchet, who was a considerable proprietor in the district, and given to Raph de Burun —thus commencing the Byron associations which constitute Hucknall's chief title to fame— but neither of these great lords resided here or retained any of its land to their own use. Its bare dozen of recorded individuals may have represented 50 to 60 inhabitants, and for some reason or other its taxable value declined from 38s. to 19s. within the next twenty years. Its name then figures in Domesday as "Hochenale," but the "u" was soon generally reinstated and has remained in the common spelling since the 12th century. In 1154 when the last William Peverel, fled from the wrath of Henry II his estates were seized by the Crown, his portion here being given to Prince John by whose reign the fee of Burun passed to the Briweres. Within the next half century other notable changes occurred; new occupiers who were virtually owners subject to certain feudal rights of overlordship, had appeared and the long story of monastic grants had begun. Among the new proprietors was Geoffrey Torcard the first of the line (which may have descended from the local "man" or agent of Ralph de Burun, which gave its name to the village to distinguish it from Hucknall-under-Huthwaite, near Sutton-in-Ashfield, and Ault Hucknall over the Derbyshire border. Another new family was that of the Costes of whom the first was Coste the falconer. His successors held property by service of keeping a falcon for the king, a not uncommon form of, tenure and one which survived for centuries in connection with this land in Hucknall. The Buruns who were generous benefactors to Lenton Priory bestowed nothing here upon it, but in the time of Henry II Galfrid Torcard accorded its monks the right to have a cart perpetually gathering dead wood on his wood at Hucknall, and William de Heriz granted them timber for the repair, whenever needed, of the mill at Widmerpool he had given them. The priories of Felley and Beauvale each acquired land in this parish, and in 1400 John Clerc, of "Hukenal Torcard," was a benefactor to the priory at Bolton-on-Dearne. When the Deyncourt chantry was founded in Thurgarton Priory church part of its maintenance came from Hucknall, but Newstead Priory was the great monastic proprietor. At its foundation is received 80a. of land and the advowson of the church, which had been enlarged about 1090, the lower portion of its tower being a survival of that period. The canons of Newstead Priory soon managed to appropriate the church, taking its revenues and serving the cure by one or other of its brethren after paying for a short period the stipends of vicars. There followed a stream of pious benefactions, that of Wiliam de Cossall consisting of 80a of waste believed to have been later transformed into the Bulwell Hall Estate. All these properties remained with their monkish, owners until the Reformation, when those of Newstead passed to the Byrons. Meanwhile new races of overlords and mesne (between) lords had been succeeding each other, and various manors had been created as more land was won from the waste. Population had kept pace with these developments, and for their use a north aisle with an adjoining Lady Chapel had been added to the church. The Black Death was followed by the common disorders of the 14th century. From time to time men of Hucknall were gaoled at Nottingham for forest trespasses, and gangs of outlaws roamed and robbed. In 1356 they waylaid even the king justice on his way from the sessions at Nottingham, and after assaulting him and his servants they made off with his horse and valuables—an event which may have formed the basis of a Robin Hood ballad of Robin Hood and the so-called sheriff of Nottingham. In 1451a commission was appointed to deal with a complaint of the inhabitants of Hucknall and Papplewick that John Strelley (of Linby) had "obstructed a highway extending from Huknall Torkard to Papulwyk whereby common transit of men, horses, and carriages has been had tune out of mind" and the existence, of a fulling mill shows that cloth-working, was a local industry. THE dissolution of the priories at Newstead, Beauvale, and Felley entailed the dispersal into lay hands of their possession and in this welter of change the Byrons became once again the chief lords of Hucknall. It seems strange to read that for some £800 or so Sir John Byron obtained Newstead "Abbey " with its possessions and that his bargain included most of this parish. By subsequent purchases he increased his holding and developed it. The property here remained with his descendants until 1774 when the "Wicked" Lord Byron sold it to the trustees of the Duke of Devonshire; in 1814 it came to the Portland Estate by exchange. The old religious creed did not locally give way to the new without difficulty, for in 1545 the Romish priest resigned the living and his Protestant successor of 1550 was deprived by Queen Mary. A generation later the second Sir John Byron emparked the Bulwell Wood estate and erected there the original Hall which in 1630 was replaced by a family residence which after undergoing vicissitudes still remains. It is said that the stocking frame made its appearance here soon after William Lee of Calverton, invented it, about 1589, and framework-knitting became the staple industry and so remained until the sinking of the coalpits in and after 1861.